It sounds rather like a singer and her backing group, doesn’t it? But, in fact, today we have two fantastic talks in the Prim Perfect Pavilion. 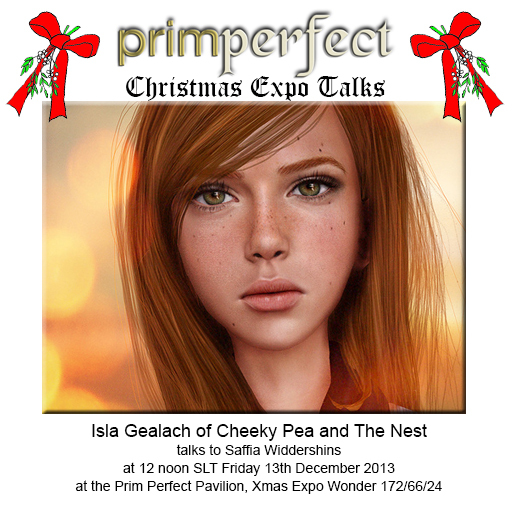 At 12 noon SLT, Saffia will be talking with Isla about her store, Cheeky Pea about her beautiful store and her shopping region. 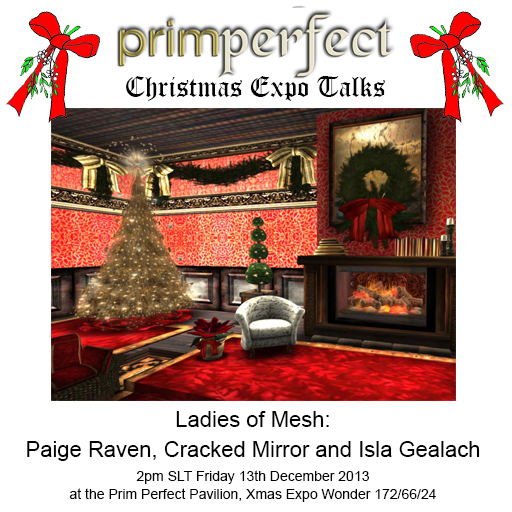 At 2pm SLT, Saffia will be talking to the Ladies of Mesh – Paige Raven of Cozy Homes, Cracked Mirror of Cracked Mirror & LaRoo, and Isla Gealach of Cheeky Pea & the Nest – and possibly some surprise guests as well! And we also have a full schedule of our talks over the whole of the Christmas Expo. In addition – have you voted for the Avie Choice Awards? Prim Perfect, Designing Worlds and Happy Hunting have all been nominated – as well as events we have played a part in organising such as Second Life’s Tenth Birthday, One Billion Rising and the Home and Garden Expo … as well as many, many friends across Second Life. Next Post: It’s Christmas at Happy Hunting! !